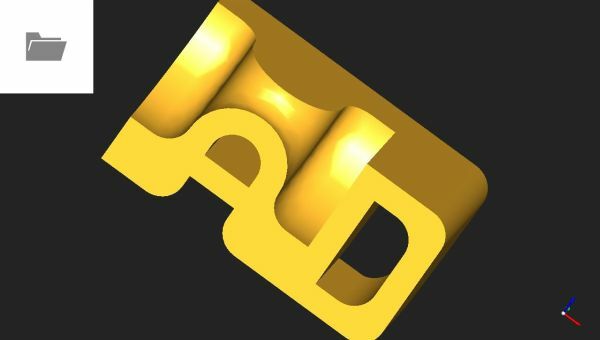 Welcome to Open CASCADE Technology (OCCT), a software development platform providing services for 3D surface and solid modeling, CAD data exchange, and visualization. Most of OCCT functionality is available in the form of C++ libraries. 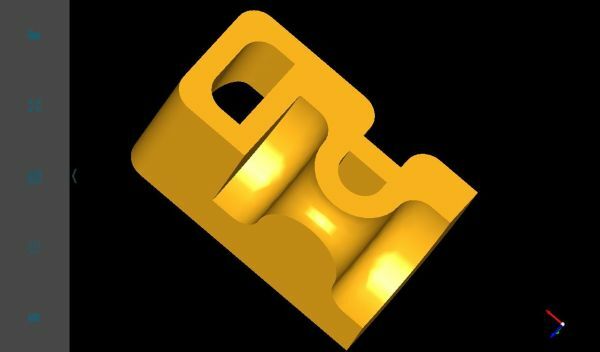 OCCT can be best applied in development of software dealing with 3D modeling (CAD), manufacturing / measuring (CAM) or numerical simulation (CAE). 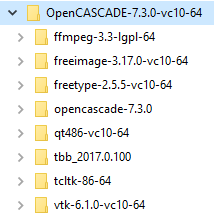 Open CASCADE Technology and all materials, including this documentation, is Copyright (c) 1999-2018 by OPEN CASCADE S.A.S. All rights reserved. Open CASCADE Technology is free software; you can redistribute it and / or modify it under the terms of the GNU Lesser General Public License (LGPL) version 2.1, with additional exception. Add the notice visible to the users of your application clearly stating that Open CASCADE Technology is used in this application, and that they have rights in this regard according to LGPL. Such notice can be added in About dialog box (this is mandatory if this box contains copyright statements) or a similar place and/or in the documentation. The text of LGPL license should be accessible to the user. Make the copy of OCCT sources used by the application available to its users, and if necessary provide instructions on how to build it in a way compatible with the application. Ensure that the user actually can exercise the right to run your application with a modified version of OCCT. If the application is distributed in a form that does not allow the user to modify OCCT part (e.g. the application is linked to OCCT statically or is distributed via AppStore on iOS, GooglePlay on Android, Windows Store, etc. ), the application should be provided separately in a modifiable form, with all materials needed for the user to be able to run the application with a modified version of OCCT. If you want to use Open CASCADE Technology without being bound by LGPL requirements, please contact Open CASCADE company for a commercial license. Note that Open CASCADE Technology is provided on an "AS IS" basis, WITHOUT WARRANTY OF ANY KIND. The entire risk related to any use of the OCCT code and materials is on you. See the license text for formal disclaimer. You are hereby informed that all software is a property of its respective authors and is protected by international and domestic laws on intellectual property and trademarks. Should you need further information, directly contact the authors. CAS.CADE and Open CASCADE are registered trademarks of OPEN CASCADE S.A.S. The following parties are acknowledged for producing tools which are used within Open CASCADE Technology libraries or for release preparation. You are hereby informed that all rights to the software listed below belong to its respective authors and such software may not be freely available and/or be free of charge for any kind of use or purpose. We strongly recommend that you carefully read the license of these products and, in case you need any further information, directly contact their authors. Tcl is a high-level programming language. Tk is a graphical user interface (GUI) toolkit, with buttons, menus, listboxes, scrollbars, and so on. Taken together Tcl and Tk provide a solution to develop cross-platform graphical user interfaces with a native look and feel. Tcl/Tk is under copyright by Scriptics Corp., Sun Microsystems, and other companies. However, Tcl/Tk is an open source, and the copyright allows you to use, modify, and redistribute Tcl/Tk for any purpose, without an explicit license agreement and without paying any license fees or royalties. To use Tcl/Tk, refer to the Licensing Terms (https://www.tcl.tk/software/tcltk/license.html). FreeType 2 is developed by Antoine Leca, David Turner, Werner Lemberg and others. It is a software font engine that is designed to be small, efficient, highly customizable and portable while capable of producing high-quality output (glyph images). This product can be used in graphic libraries, display servers, font conversion tools, text image generation tools, and many other products. FreeType 2 is released under two open-source licenses: BSD-like FreeType License and the GPL (https://www.freetype.org/license.html). Intel(R) Threading Building Blocks (TBB) offers a rich and complete approach to expressing parallelism in a C++ program. It is a library that helps you to take advantage of multi-core processor performance without having to be a threading expert. Threading Building Blocks is not just a threads-replacement library. It represents a higher-level, task-based parallelism that abstracts platform details and threading mechanisms for scalability and performance. TBB version 2017 is available under Apache 2.0 license, while older versions until 4.4 are available under GPLv2 license with the runtime exception (https://www.threadingbuildingblocks.org). OpenGL is an industry standard API for 3D graphics used by OCCT for implementation of 3D viewer. OpenGL specification is developed by the Khronos group, https://www.khronos.org/opengl/. OCCT code includes header file glext.h obtained from Khronos web site. VTK – The Visualization Toolkit (VTK) is an open-source, freely available software system for 3D computer graphics, image processing and visualization. OCCT VIS component provides adaptation functionality for visualization of OCCT topological shapes by means of VTK library. If you need further information on VTK, refer to VTK Homepage http://www.vtk.org/. Doxygen developed by Dimitri van Heesch is open source documentation system for C++, C, Java, Objective-C, Python, IDL, PHP and C#. This product is used in Open CASCADE Technology for automatic creation of Technical Documentation from C++ header files. If you need further information on Doxygen, refer to https://www.stack.nl/~dimitri/doxygen/index.html. Graphviz is open source graph visualization software developed by John Ellson, Emden Gansner, Yifan Hu and Arif Bilgin. Graph visualization is representiation of structured information as diagrams of abstract graphs and networks. This product is used together with Doxygen in Open CASCADE Technology for automatic creation of Technical Documentation (generation of dependency graphs). Current versions of Graphviz are licensed on an open source basis under The Eclipse Public License (EPL) (http://www.graphviz.org/License.php). Inno Setup is a free script-driven installation system created in CodeGear Delphi by Jordan Russell. In OCCT Inno Setup is used to create Installation Wizard on Windows. It is licensed under Inno Setup License (http://www.jrsoftware.org/files/is/license.txt). FreeImage is an Open Source library supporting popular graphics image formats, such as PNG, BMP, JPEG, TIFF, and others used by multimedia applications. This library is developed by Hervé Drolon and Floris van den Berg. FreeImage is easy to use, fast, multithreading safe, compatible with all 32-bit or 64-bit versions of Windows, and cross-platform (works both with Linux and Mac OS X). FreeImage is optionally used by OCCT to work with images, on conditions of the FreeImage Public License (FIPL) (http://freeimage.sourceforge.net/freeimage-license.txt). David M. Gay's floating point routines (dtoa.c) are used for fast reading of floating point values from text strings. These routines are available under MIT-like license (see http://www.netlib.org/fp/). Cotire (compile time reducer) is a CMake module that speeds up the build process of CMake based build systems by fully automating techniques as precompiled header usage and single compilation unit builds for C and C++. Cotire is included in OCCT repository and used optionally by OCCT CMake scripts to accelerate builds by use of precompiled headers. Cotire is licensed under the MIT license (https://github.com/sakra/cotire/blob/master/license). FFmpeg is an Open Source framework supporting various image, video and audio codecs. FFmpeg is optionally used by OCCT for video recording, on LGPL conditions (https://www.ffmpeg.org/legal.html). MikTEX is up-to-date implementation of TeX/LaTeX and related programs for Windows. It is used for generation of User and Developer Guides in PDF format. See https://miktex.org for information on this tool. Adobe Systems, Inc. provides Adobe Reader, which can be used to view files in Portable Document Format (PDF). This overview provides general description of OCCT structure, functionality, modules, and features. It is available in HTML format (generated by Doxygen) and includes User and Developer Guides. The sources of this documentation are contained in dox subdirectory of OCCT sources (plain text format is used, with mixed MarkDown / Doxygen syntax mark-up). User and Developer Guides describing in details OCCT modules and development tools are also available in Adobe Portable Document Format (PDF). To read this format, you need Adobe Acrobat Reader, which is a freeware and can be downloaded from the Adobe site. Full reference documentation covering all OCCT classes generated automatically by Doxygen software is provided in HTML format. Reference documentation is presented in Modules –> Toolkits –> Packages –> Classes logic structure with cross-references to all OCCT classes and complete in-browser search by all classes. See OCCT Documentation Guide for details on OCCT documentation system. To generate HTML documentation from sources contained in dox subdirectory, you need to have Tcl and Doxygen 1.8.5 (or above) installed on your system. Use script gendoc (batch file on Windows, shell script on Linux / Mac OSX) to generate documentation. Run this command without arguments to get help on supported options. Open CASCADE Technology is designed to be highly portable and is known to work on wide range of platforms. Current version is officially certified on Windows (IA-32 and x86-64), Linux (x86-64), OS X / macOS (x86-64), Android (armv7 and x86), and iOS (armv7, arm64) platforms. The tables below describe the recommended software configurations for which OCCT is certified to work. 1) VC++ 10 64-bit is used for regular testing and for building binary package of official release of OCCT on Windows. Free disk space (complete installation) 600 MB approx. In most cases you need to rebuild OCCT on your platform (OS, compiler) before using it in your project, to ensure binary compatibility. See Building OCCT from sources for instructions on building OCCT from sources on supported platforms. On Windows Open CASCADE Technology can be installed with binaries precompiled by Visual C++ 2010 with installation procedure. If you have a previous version of OCCT installed on your station, and you do not plan to use it along with the new version, you might want to uninstall the previous version (using Control Panel, Add/Remove Programs) before the installation of this new version, to avoid possible problems (conflict of system variables, paths, etc). Attention: For full installation OCCT requires approximately 650 Mb of disk space, but during the installation process you will need 1,2 Gb of free disk space. OCCT installation with reference documentation requires 1,4 Gb on disk. Launch the installer and follow the instructions. samples This folder contains sample applications. tests This folder contains scripts for OCCT testing. tools This folder contains sources of Inspector tool. To run any Open CASCADE Technology application you need to set the environment variables. You can define the environment variables with env.bat script located in the $CASROOT folder. This script accepts two arguments to be used: the version of Visual Studio (vc10 – vc141) and the architecture (win32 or win64). The additional environment settings necessary for compiling OCCT libraries and samples by Microsoft Visual Studio can be set using script custom.bat located in the same folder. You might need to edit this script to correct the paths to third-party libraries if they are installed on your system in a non-default location. Script msvc.bat can be used with the same arguments for immediate launch of Visual Studio for (re)compiling OCCT. If OCCT was built by Code::Blocks, you can define the environment variables with env_cbp.sh or custom_cbp.sh script. If OCCT was built by Automake, you can define the environment variables with env_amk.sh or custom_amk.sh script. The scripts are located in the OCCT root folder. CSF_XmlOcafResource is required in order to set the path to XSD resources, which defines XML grammar. Draw is a command interpreter based on TCL and a graphical system used for testing and demonstrating OCCT modeling libraries. Draw can be used interactively to create, display and modify objects such as curves, surfaces and topological shapes. Scripts can be written to customize Draw and perform tests. New types of objects and new commands can be added using C++ programming language. A command interpreter based on TCL command language. A 2D an 3D graphic viewer with support of operations such as zoom, pan, rotation and full-screen views. An optional set of geometric commands to create and modify curves and surfaces and to use OCCT geometry algorithms. A set of topological commands to create and modify BRep shapes and to use OCCT topology algorithms. A set of graphic commands for view and display operations including Mesh Visualization Service. A set of Application framework commands for handling of files and attributes. A set of Data Exchange commands for translation of files from various formats (IGES,STEP) into OCCT shapes. A set of Shape Healing commands: check of overlapping edges, approximation of a shape to BSpline, etc. You can add new custom test harness commands to Draw in order to test or demonstrate a new functionality, which you are developing. Currently DRAW Test Harness is a single executable called DRAWEXE. Commands grouped in toolkits can be loaded at run-time thereby implementing dynamically loaded plug-ins. Thus you can work only with the commands that suit your needs adding the commands dynamically without leaving the Test Harness session. Declaration of available plug-ins is done through special resource file(s). The pload command loads the plug-in in accordance with the specified resource file and activates the commands implemented in the plug-in. The whole process of using the plug-in mechanism as well as the instructions for extending Test Harness is described in the Draw Test Harness. Draw Test Harness provides an environment for OCCT automated testing system. Check its Automated Testing System for details. The DRAWEXE executable is delivered with the installation procedure on Windows platform only. To start it, launch DRAWEXE executable from Open CASCADE Technology/Draw Test Harness item of the Start\Programs menu. Launch Draw executable from Open CASCADE Technology\Test Harness\Draw Test Harness item of the Start\Programs menu or Use $CASROOT\draw.bat file to launch DRAWEXE executable. Type box b -10 -10 -10 20 20 20 to create a cube b of size 20, parallel to the X Y Z axis and centered on the origin. The cube will be displayed in the axonometric view in wireframe mode. cad.tcl: creates solid shape looking like abbreviation "CAD"
Visual C++ programming samples containing 10 Visual C++ projects illustrating how to use a particular module or functionality. Read carefully readme.txt to learn about launching and compilation options. 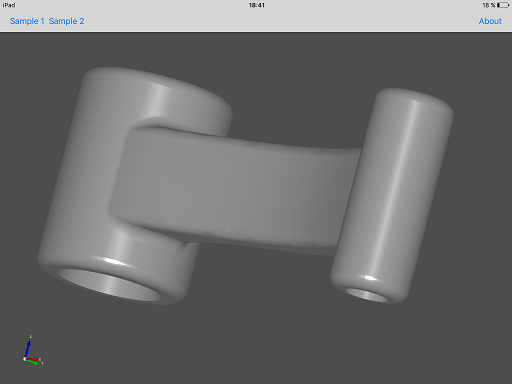 Import Export programming sample contains 3D Viewer and Import / Export functionality. The Qt programming tutorial teaches how to use Open CASCADE Technology services to model a 3D object. The purpose of the tutorial is not to explain all OCCT classes but to help start thinking in terms of the Open CASCADE Technology. This tutorial assumes that the user has experience in using and setting up C++. From the viewpoint of programming, Open CASCADE Technology is designed to enhance user's C++ tools with high performance modeling classes, methods and functions. The combination of these resources allows creating substantial applications. To start a sample on Windows use Open CASCADE Technology\Samples\Qt\ item of the Start\Programs menu. C# sample demonstrates integration of OCCT 3D Viewer and Import / Export functionality into .NET applications (using Windows Forms and WPF front ends). See C# sample Readme for details. There is also another C# example with the same functionality, which demonstrates the integration of Direct3D Viewer into .NET applications using WPF front end. See Direct3D C# sample Readme for details. Java – See Android Java sample Readme for details. Qt – See Android Qt sample Readme for details. There is a sample demonstrating usage of OCCT on iOS with Apple UIKit framework. See iOS sample Readme for details.